FREEWAY RIDE! - Bikes not Bombs! Four minute video showing Bikes not Bombs during some gentle moments on Day X, followed by the FREEWAY FUNKY HUSTLE! This is the 56 K version. Bikes not Bombs rolled all day from 7AM until Midnight on Day X, all over the City. This video shows not only some of the peaceful bike-in moments in the afternoon, but the racy freeway dash. More story and photos below. §Stop the Oil War! A helicopter lights up the group. This short freeway ride was perfectly legal under state law. Although most of the 30-50 who participated got away, unfortunately about 15 including one legal observer were arrested. Reportedly at least one was stopped all the way at the Bay Bridge. At least one was a minor and the main group does not know who she or he was. The main group that was arrested consisted of 7 women and 6 men of varied backgrounds and nationalities. The group entered at the 8th and Bryant onramp, right over the CHP headquarters. After the main group exited the freeway, a group of SFPD motorcycle officers arrived belatedly at the off-ramp. Some bicyclists were in the area having rode along Bryant in solidarity with the riders. One officer in particular was very abusive, driving over one woman\'s bicycle tire and being very physically abusive with several present. Some observers left at that point, one after the air in his rear tire was let out by an officer using his baton to push the valve. One woman describes how he stood still and held the baton in place as if hoping to escape notice. This is not the first time that police officers have flattened demonstrators\' bicycle tires during the course of a false arrest. One woman reports that SFPD Officer Nicholson\'s physical abuse included grabbing her around her neck. She describes him as a white male with a white moustache, glasses and a shaved head. She was so traumatized and upset by his behavior that she is willing to take action to report him. The legal observer present who knew that the ride had been a legal one continuously asked to speak with the commanding officer to explain that. He was told, \"You\'ll be able to after you are arrested\" by SFPD officers, effectively denying him the right to prevent the arrests through reason. SFPD officers then ordered those who had been standing on the sidewalk before their arrival, to walk over onto the freeway offramp! This is analogous to planting something illegal on an innocent person because even through the freeway ride was not illegal, the CHP has a long pattern and practice of refusing to recognize the bicyclists\' rights to do so. A swarm of CHP motorbikes descended the off-ramp until literally fifty motorcycles filled the area with a deafening roar and a blinding sea of lights. Reportedly four motorbikes were damaged in the operation. Sgt. Clare later ordered her officers to fill out damaged equipment reports explaining what happened. Bicyclists were then roughly arrested and given no chance to explain the situation to CHP. One rider who was arrested by officers up on the \"bridge\" (I-80) says that as he was put in cuffs by several motorcycle officers, that he truly feared for his life as they proposed in angry voices that he be thrown off the bridge. He was all alone on the freeway at that time and truly believed that they intended to do so. 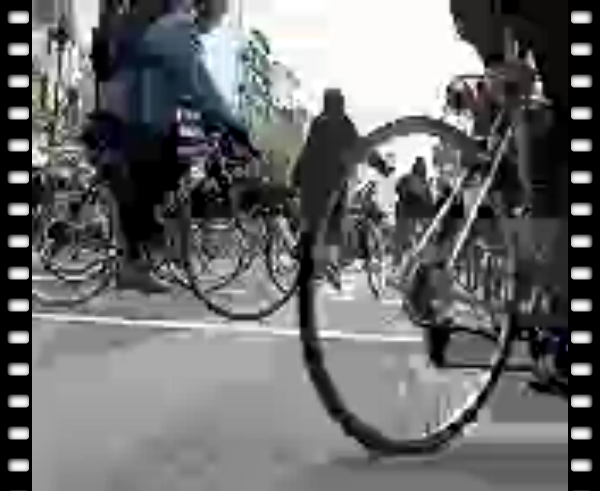 Thanks to a call to (415) 285-1011 by one bicyclist observing, National Lawyers\' Guild (NLG) legal observers arrived as the group was being put into an arrest van. The van had seats but was difficult to enter due to the slippery raised plastic covering the wheel. A television crew arrived and got some footage of the arrests. Demonstrators later wished that they had chanted \"BIKES NOT BOMBS!\" for the camera, but people were too surprised and spread out by the excessive police response. Three of the arrestees\' plastic handcuffs were extremely tight, with tingling fingers and hands turning blue in at least one instance. CHP officers refused to identify who the officer was who handcuffed them so. However, within 30-40 minutes (estimated) the group had been transported to the CHP headquarters, where their cuffs were eventually adjusted or replaced with metal cuffs in one instance. The bicycles were loaded up on the Caltrans bicycle shuttle, which holds fifteen bikes. A CHP arrest is quite different from many of the SFPD arrests during the day. Everything is removed from the person and categorized, and the arrestees are kept in handcuffs throughout their time in custody with the CHP. After several hours in cuffs, demonstrators were in significant pain in their shoulders and other parts of their bodies. The bicycle and everything on it is impounded as one unit, not to be returned without special appointments with one lone officer who conveniently was sent out into the field indefinintely the next day (Friday) and who does not work on weekends. At least one rider had important personal items in his basket which he needed but which were not returned on release. No property receipts were issued. Requests for such things as the opportunity to go to the bathroom, or concerns about property left on the bicycles, went unanswered for up to 30 minutes despite repeated requests. While in custody, the bicyclists were surprised to find themselves in the briefing room filled with CHP propaganda and operations information. A large map showed laminated printouts of the Act Against War website (http://www.actagainstwar.org) including the description of BIKES NOT BOMBS. The \"dinner menu\" of direct action plans had been given colored labels by category and corresponding colored tabs (red-green-yellow) had been placed over a large map. Strangely enough, freeways and the bridge did not seem to be amongst them despite the importance of blocking them in past Gulf War protests (e.g., in 1991). During the bicyclists\' confinement there, a very large group of CHP officers entered for a briefing, which was a very strange experience indeed, to be in handcuffs surrounded by standing room only state police, some of whom glared at the arrestees or made comments about them, but most of whom paid them no overt attention. On the whiteboard at the front of the room was written, \"Oakland (crossed out) SF 97 / HAVE NO FEAR\", which no officer would explain. On a pile of videos next to a television was a commercial release of a \"COPS\" episode. At the front of the room, a laminated terrorist alert sign over a map of California had an orange laminated placard affixed stating that today was an ORANGE ALERT day. Fortunately, many bicyclists had worn orange, utilized orange cones, and been alert all day. 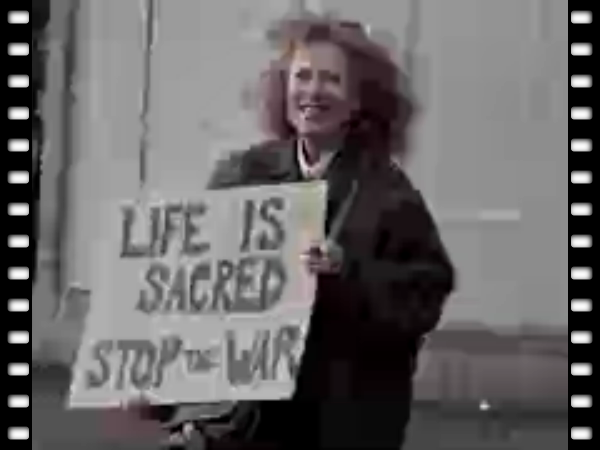 There was also a color safety advertisement showing a close-up of an officer hoisting a large military rifle, with words to the effect, \"Is it safe to clear your weapon?\"
Arrestees were then moved into a communications room where a printout on the wall described the days\' events under the heading, \"FEDERAL DISASTER NAME: Iraq War Protest\". One arrestee commented that they were right about it being a Federal Disaster, but wrong about the name -- that they should have removed the last word. Arrestees were eventually taken to the Pier 27 holding cell, where bathrooms were finally reasonably available (the filthiest port-a-potties one arrestee had ever seen). The area was very toxic, with a huge generator and propane heater being situated right next to the demonstrators\' pen. People with chemical sensitivities were suffering. ONe experienced shortness of breath, sore throat, feverish feelings, and had to sit near the filthy floor to maximize the ratio of fresh air to poisoned air. A nurse brought him water, which was helpful, and she criticized the entire operation but said she had no power to change it. The adults were released after 11 PM after being cited out for 647(c) PC, \"Disorderly Conduct\" for \"begging or soliciting alms\". Although the CHP had promised that bicycles and other important property on the bikes would be available the next day, and even promised this on that day by telephone, they changed their story and reneged on the promise when one arrestee made the trip to San Francisco to pick up his bicycle, meaning Monday will be his first opportunity to receive it. open to the public for the purpose of begging or soliciting alms. The freeway was legal for the bicycle demonstrators to use. Bicycles are only prohibited from freeways if signs saying so are posted (such prohibition \"shall be effective when appropriate signs giving notice thereof are erected upon any freeway and the approaches thereto\", CVC 21960). This is in part because people riding bicycles for transportation and recreation throughout the state need to use the freeways simply to get around. In some places, no reasonable alternate route exists. In reality, over 1,000 miles of California freeway are open to bicycles. Extensive safety studies have shown that -- although counterintuitive for some -- riding along the shoulders of freeways are safer than city streets, in part because of long sight lines and lack of intersections. Crossing offramps on the other hand, is much more dangerous when high-speed traffic is present. This does not make doing so illegal, however, and the riders were actually travelling at the normal speed of traffic (which was fairly slow) at that time, so they furthermore had the legal right to occupy any part of the entire roadway that they wished to, under CVC 21202(a). Maintaining freeways for oil-war-inducing motor vehicles alone is discrimination and an outrage. Ever notice how dank and horrifically polluted it is under the freeways these cyclists rode on? The elevated viaducts have comparatively fresh air and a great view, and no obstructions -- a steady downhill ride for the bicycles into downtown and a good advertisement for the motorists stuck in their own cesspool of congestion. It is an injustice to even suggest prohibiting the bicycles from them, but the CHP by their actions and statements to date appears to consider doing so an extreme crime. This attitude is far out of alignment with public needs, basic justice, the explicitly stated wishes of the legislature, and State Law. This rogue police state must be stopped from their decades long repressive campaign against alternative transportation.